____avant gardening______________________: Dinah Bird: a radio relay for "A Box of 78s"
Dinah Bird: a radio relay for "A Box of 78s"
Tonight, Avant Gardening is delighted to be the latest port of call in a 22-station traveling radio relay, which since November 2014 has been distributing the aural contents of Dinah Bird's work A box of 78s to the listeners of radio stations around the world. by the time it is played over the R1 airwaves, the record will have accumulated scratches and associated material traces from 17 other stations in 13 countries. Like the peer-to-peer share culture of the radia network, but conducted via the pre-digital distribution methods of the postal service, the radio relay for a box of 78s is a form of audio mail art. "It is not a race, quite the opposite. It is a playful protest against the way sound is propagated in the digital age. The idea is simple. I have made a piece of radio pressed to vinyl available on Gruenrekorder. 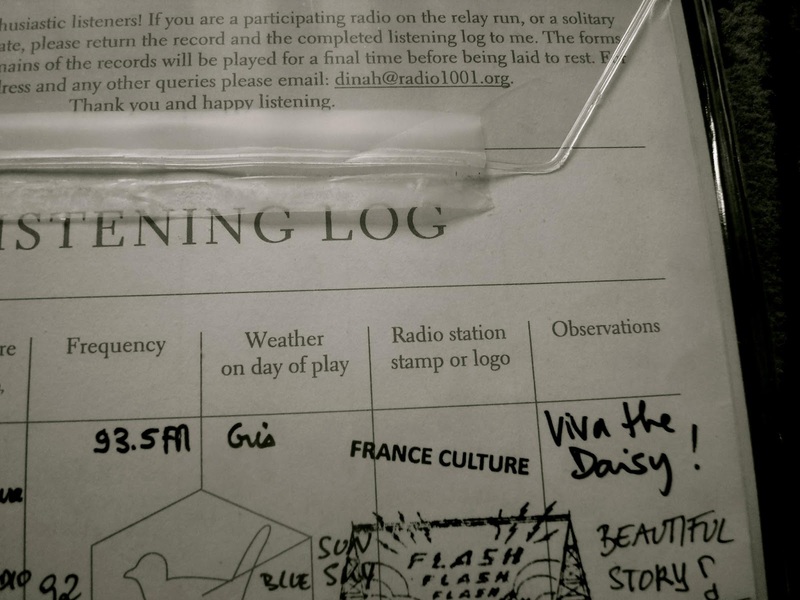 I would like the same copy of the record to be relayed between the different partner radio stations, so that no single broadcast sounds the same. The scratches formed en route will become part of the piece, mirroring the journey my grandmother’s records made. 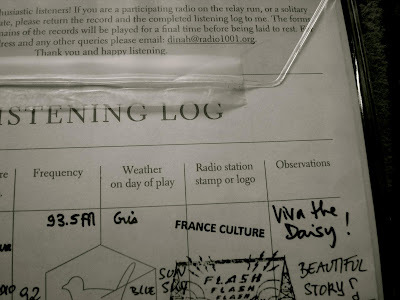 I will also ask each station that plays the record to fill in a listening log, a bit like the piece of paper that used to get stamped when you took a book out of the library. So far twenty one radio stations from places as far flung as Newfoundland and Dunedin have agreed to take part and play the record whatever state it might be in after all its travels. It is a radio relay, a kind of chain letter if you like. I am hoping that sometime around October 2015 the record and the physical traces if its journey will be returned to me, accompanied by the written observations of those who have played it." "This is the story of a box: A leather box that is over eighty years old and has lived in three different countries, and on two different continents. It contains over fifty 78 rpm recordings of classical music and opera hits of the day. The box and its contents were inherited by my grandmother who was born on the Gulf Islands, British Columbia, in 1910. She grew up on Salt Spring. She took the box with her when she left the island in 1925 and carried it to her various adult homes until her death in 2000. 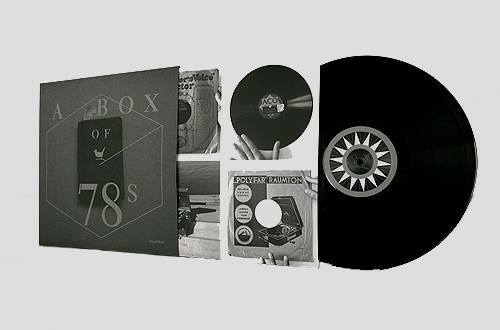 In September 2012 I retraced the box’s long journey and took the records back to the island where they were first played. Using my great-grandfather’s diary and daily notes on the weather as a guide, I played the records outdoors, on a portable gramophone in spots around Salt Spring where my grandmother and her family had picnics, played tennis or danced, and I recorded what happened. I also talked to today’s Salt Springers, and my late Great Uncle, about their memories and reasons for being on the island. 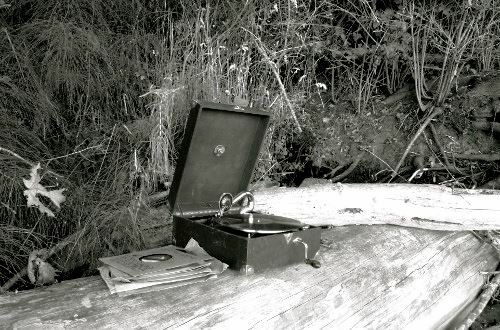 This composed sound work blends memories, observations, field recordings and music. This piece is about rekindling lost, and perhaps forgotten, sounds. Are they so very different to those my grandmother heard? It is a personal response to the people and places of Salt Spring Island, British Columbia." The Lake Radio , Copenhagen, DK. Radio Nova , Oslo, Norway. Radio Worm , Rotterdam, Netherlands. Radio Panik , Brussels, Belgium. Radio Papesse , Florence, Italy. Nova , on RTE Lyric FM, Ireland. Soundart Radio , Devon, UK. Radio Grenouille , Euphonia, Marseille, France. Voice of Bonne Bay , Newfoundland, Canada. Wave Farm, WGXC 90.7 FM, Accra, NY. USA. CRFC 101.9 FM, Kingston, Ontario, Canada. CKUW 95.9 FM , Winnipeg, Manitoba, Canada. Tree Frog radio, Denman Island, BC, Canada. Radio One (91 FM) Dunedin, NZ. Radio Campus Bruxelles , Belgium. HRT _ Croatian Radiotelevision , Zagreb. Radio Campus Grenoble , France. Avant Gardening will follow the broadcast of Dinah's work with an airing of other recent sound projects which also explore the tactile materiality of recorded media in the digital age.